Enjoy some grated Parmesan on your pasta -- but pass up the cheese dip. Soft cheeses made with unpasteurized milk can harbor listeria bacteria, which can be dangerous or even life-threatening for you and your baby. 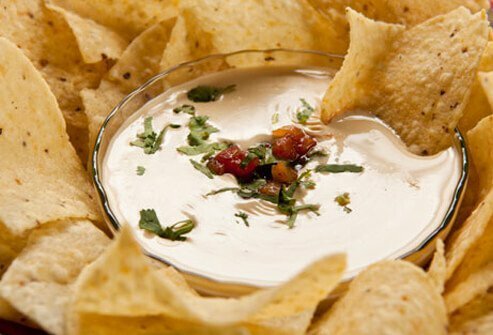 It's best to avoid brie, Camembert, feta, blue cheese, queso blanco, queso fresco, and panela -- unless the label says it's pasteurized. When in doubt or dining out, ask before you eat. Now is the time to order all steaks and burgers fully cooked. 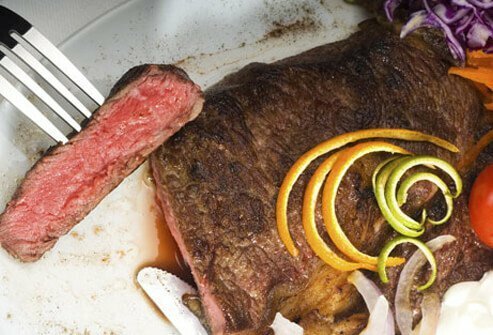 Raw or undercooked meat can harbor toxoplasma and other bacteria. When dining out, make sure your meat is steaming hot and thoroughly cooked. At home, the temperature should reach at least 145 F for whole cuts, 160 F for ground meats like hamburger, and 165 F for chicken breasts. 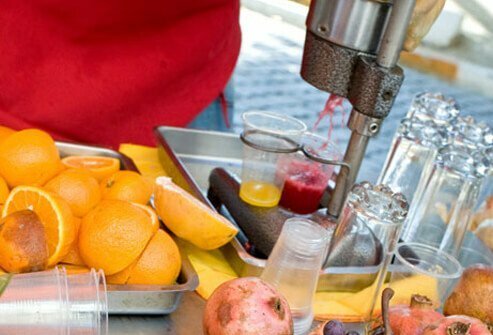 Fresh-squeezed juice in restaurants, juice bars, or farm stands may not be pasteurized to protect against harmful bacteria, including salmonella and E. coli. Some markets also sell raw, unpasteurized juice in the refrigerated case -- look for the required warning label, and steer clear. Pregnant women should opt for juice that is pasteurized. Juice in boxes and bottles on your supermarket shelf is also safe. When you're baking cookies, you may be tempted to pop a bit of raw dough in your mouth. But if the dough contains raw eggs, even a taste could pose a risk. The CDC estimates one in 20,000 eggs is tainted with salmonella bacteria. 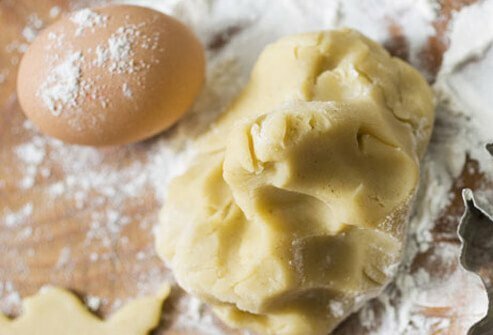 To be safe, resist tasting unbaked cookie dough, batter, or filling made with raw eggs. The good news: Store-bought cookie dough ice cream is safe. 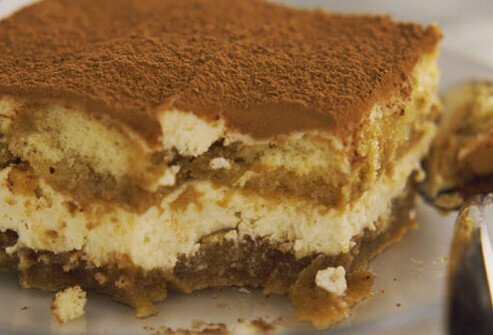 Opt for store-bought versions, which are made with pasteurized eggs. A pre-stuffed turkey or chicken offers a great short-cut when you're pressed for time. But the juice from fresh, raw poultry can mix with the stuffing and create a great place for bacteria to grow. Cooking usually offers protection, but pregnancy makes it harder to fight off infections. A safe alternative is buying frozen pre-stuffed poultry. 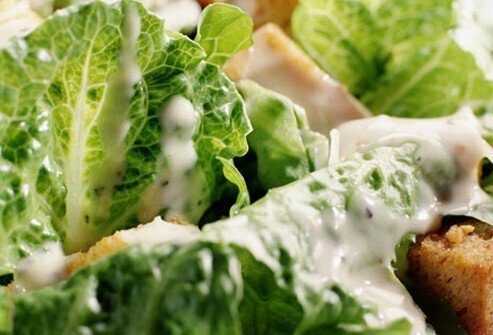 Be sure to cook it directly from frozen -- don't let it defrost first. The thigh meat should hit 180°F. Fish is good for you and your baby, but make smart choices about the fish you eat. 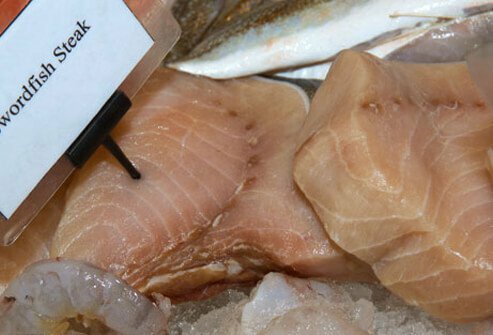 Swordfish, tilefish, king mackerel, and shark contain high levels of methylmercury. This metal can be harmful to your baby. 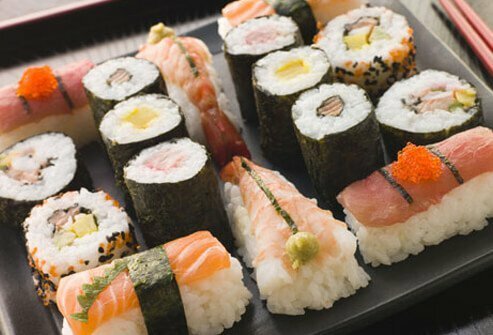 You can safely eat up to 12 ounces of seafood a week, so choose fish that are low in mercury: catfish, salmon, cod, and canned light tuna. If you like albacore (white) tuna, limit yourself to 6 ounces per week. Check with your doctor before taking fish oil or any other supplements while pregnant. Unlike many other food-borne germs, listeria can grow at the temperatures inside your fridge. 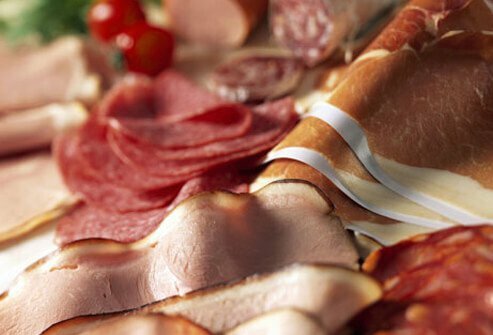 For this reason, you should avoid perishable, ready-to-eat meats, such as cold cuts and hot dogs, when you're pregnant. You can make these foods safe by heating them until they are steaming hot and eating them right away. 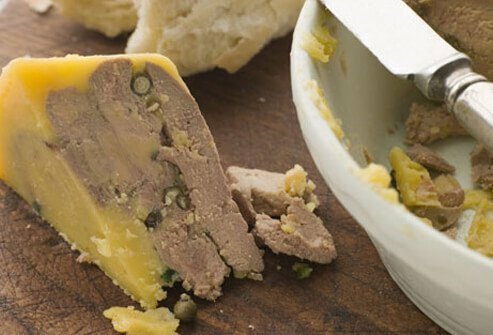 Pâtés contain perishable meats, so they may harbor listeria as well. Keeping your fridge at or below 40 F will slow the growth of this bacteria but won't stop it completely. Because pregnant women are particularly vulnerable to listeria, it's safest to avoid all refrigerated meat spreads. Spam lovers are in luck. Canned meat spreads are OK -- if not exactly healthy -- during pregnancy. Now is the time to load up on fruits and veggies! Just be sure to rinse them thoroughly under running water. A parasite called toxoplasma can live on unwashed fruits and veggies. It causes an illness called toxoplasmosis, which can be very dangerous to your baby. Don't use soap to wash produce. Instead, scrub the surface with a small vegetable brush. Cut away any bruised areas, because these may harbor bacteria. To avoid the listeria bacteria, scrub and dry cantaloupe before slicing it. 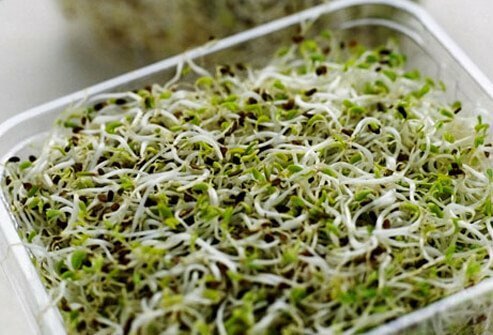 Don't eat any raw sprouts, including alfalfa, clover, and radish. Bacteria can get into the seeds before the sprouts begin to grow, and these germs are nearly impossible to wash away. At the deli, check sandwiches to make sure they don't contain raw sprouts. At home, cook sprouts thoroughly to destroy any bacteria. 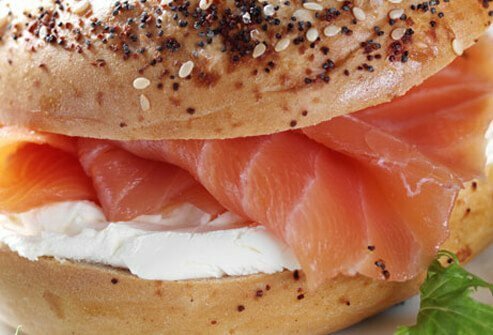 When you're expecting, it's best to skip the lox on your morning bagel. Like ready-to-eat meats, refrigerated smoked seafood is vulnerable to listeria. This includes smoked salmon (often labeled nova or lox), as well as smoked trout, whitefish, cod, tuna, and mackerel. It's safe to use smoked seafood in a cooked meal, such as a casserole. 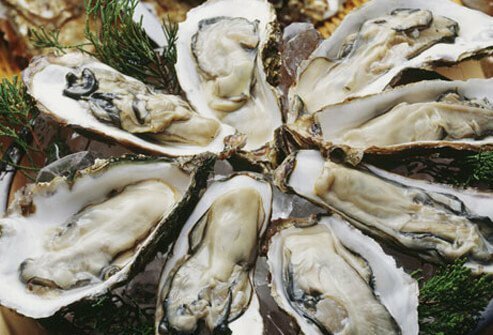 Raw shellfish is one of the top causes of illness from seafood. 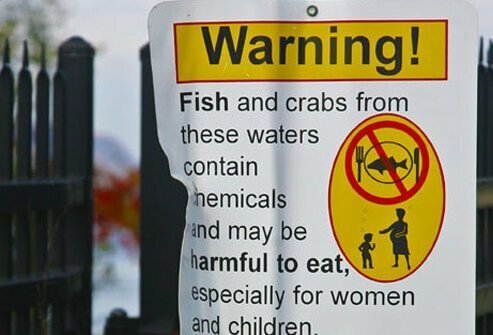 The culprits include parasites and bacteria that are generally not found in cooked seafood. So skip the oysters on the half shell. As long as you cook shellfish thoroughly, it's safe to eat during pregnancy. Cook oysters, clams, and mussels until the shells open. If any don't open, throw them away. Unless you know your local streams, bays, and lakes are unpolluted, avoid eating fish you catch yourself. Some lakes and rivers are contaminated with industrial chemicals. Locally caught bluefish, striped bass, salmon, pike, trout, and walleye may be affected. Check with your state's fish and wildlife department for more information. 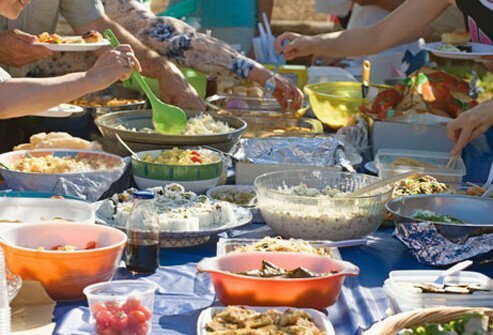 You may not want to insult your friends by avoiding their potluck offerings. But there's reason for concern if the food is left unrefrigerated for too long. Follow the 2-hour rule: Don't eat potluck dishes that have been sitting at room temperature for longer than 2 hours. When temperatures are above 90 F, the cutoff should be 1 hour. Have you ever dreamed of visiting a farm and tasting milk fresh from a cow? Wait a while. 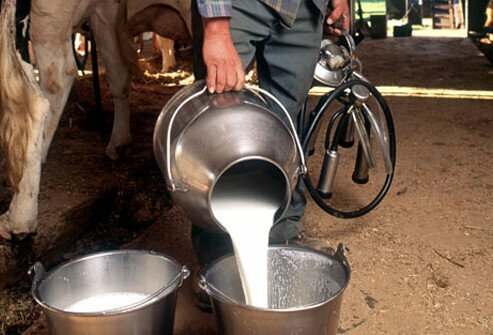 Freshly collected milk has not yet been through the pasteurization process that protects it from listeria. That can be dangerous for you and your baby. Buy milk, cheese, or dairy products from a local farm only if the label says "pasteurized." Good evidence now shows that a moderate amount of caffeine is safe during pregnancy. But the jury is still out on whether higher amounts of caffeine can increase the odds of a miscarriage. The March of Dimes recommends women who are pregnant or trying should limit caffeine to 200 milligrams per day. That's one 12-ounce cup of coffee. 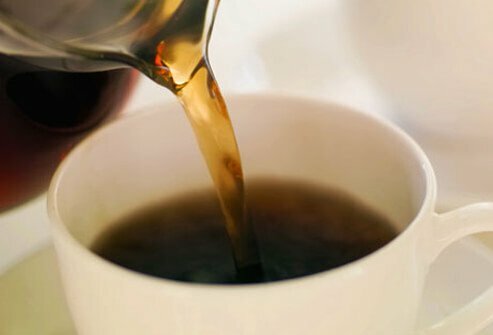 But remember, caffeine is also found in soda, tea, chocolate, and many energy drinks. You already know that heavy drinking during pregnancy can lead to serious birth defects. 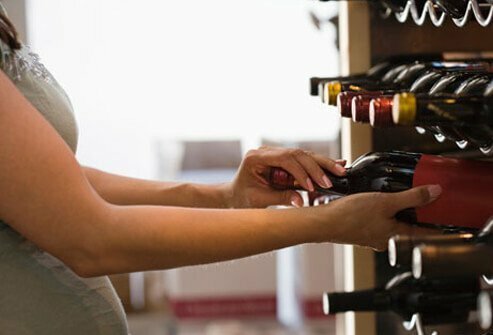 What you may not know is that even small amounts of alcohol could be harmful. No amount of drinking has been found to be safe during pregnancy, so it's best to avoid all forms of alcohol. This includes wine, beer, coolers, and traditional eggnog, which contains alcohol and raw eggs. Unless you're headed straight home from the restaurant, don't ask for a doggie bag. The inside of your car can get warm quickly, allowing bacteria to multiply. 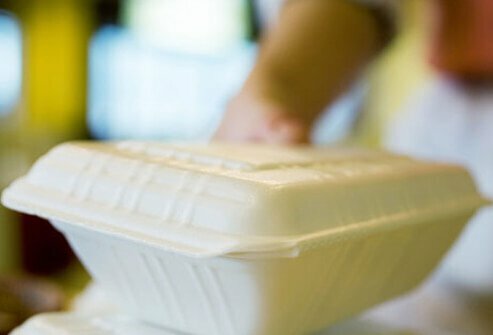 If you do take home leftovers, put them in the fridge within 2 hours of when the meal was originally served. News release, The American College of Obstetricians and Gynecologists. CDC: "Preventing Health Risks Associated with Drinking Unpasteurized or Untreated Juice," "Listeriosis." 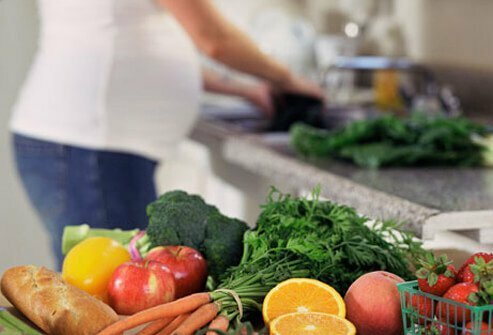 Colorado State University Extension: "Food Safety During Pregnancy." Environmental Protection Agency: "What You Need to Know About Mercury in Fish and Shellfish." FDA: "Safe Eats – Dairy & Eggs," "Safe Eats – Eating Out and Bringing In," "Safe Eats – Fruits, Veggies & Juices," "Safe Eats – Meat, Poultry & Seafood," "Safe Eats – Ready-to-Eat-Foods," "While You’re Pregnant – Listeria," "While You're Pregnant – Toxoplasma," "While You're Pregnant – Methylmercury." FoodSafety.gov: "Milk, Cheese, and Dairy Products." March of Dimes: "Food-borne Risks in Pregnancy," "Caffeine in Pregnancy," "Drinking Alcohol During Pregnancy." News Release, U.S. Department of Agriculture Food Safety & Inspection Service. USDA: "USDA Revises Recommended Cooking Temperature for All Whole Cuts of Meat, Including Pork. to 145 ºF"